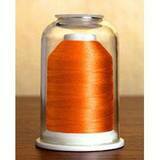 Hemmingworth revolutionized the thread industry with its patent pending spool system. Unlike other embroidery thread manufacturers, Hemmingworth thread feeds perfectly from any angle or position, and without a spool cap. Our collection of over 300 colors, including metallic and variegated, is sure to impress and win the hearts of any embroidery lover. Not only does the spool cover promote superior thread feeding, it also acts as a protective casing. The plastic container and gel stopper seal out dust and hand oil, thus preserving thread quality and extending overall thread life. And Hemmingworth is a fantastic product worth protecting. 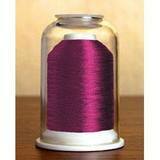 This embroidery thread is color fast, even after multiple bleach tests. The luxurious shine and unbeatable strength are what keep Hemmingworth fans coming back for more.